p. 373: “Chrome Yellow” – from Wikipedia. 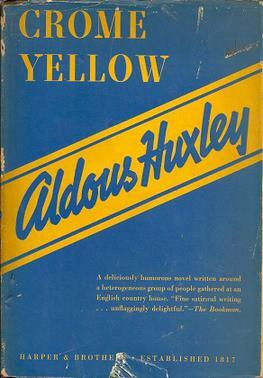 Crome Yellow is the first novel by British author Aldous Huxley. It was published in 1921. In the book, Huxley satirises the fads and fashions of the time. It is the witty story of a house party at “Crome” (a lightly veiled reference to Garsington Manor, a house where authors such as Huxley and T. S. Eliot used to gather and write). p. 374: Racine – from Wikipedia. Jean Racine (French pronunciation: [ʒɑ̃ ʁaˈsin]), baptismal name Jean-Baptiste Racine (22 December 1639 – 21 April 1699), was a French dramatist, one of the “Big Three” of 17th-century France (along with Molière and Corneille), and one of the most important literary figures in the Western tradition. Racine was primarily a tragedian, producing such ‘examples of neoclassical perfection’ as Phèdre, Andromaque, and Athalie, although he did write one comedy, Les Plaideurs, and a muted tragedy, Esther, for the young. p. 374: Peter Schlemihil – from Wikipedia. Peter Schlemiel is the title character of an 1814 story, “Peter Schlemihls wundersame Geschichte” (“Peter Schlemihl’s Remarkable Story”), written in German by exiled French aristocrat Adelbert von Chamisso. In the story, Schlemiel sells his shadow to the Devil for a bottomless wallet, only to find that a man without a shadow is shunned by human society. The woman he loves rejects him, and he spends the rest of his life wandering the world in scientific exploration. p. 374: Clown Agheb – I don’t know. It seems to be an Arabic reference as I found several Arab people with the name. I couldn’t find any references to a written work. Any clues would be appreciated. p.374: das Ding an sich – german. The thing itself. p. 378: maelstrom – from Wikipedia. A maelstrom /ˈmeɪlstrɒm/ is a very powerful whirlpool; a large, swirling body of water. A free vortex, it has considerable downdraft. Their power tends to be exaggerated by laymen. There are virtually no stories of large ships ever being sucked into a maelstrom. Tales like those by Paul the Deacon, Jules Verne and Edgar Allan Poe are entirely fictional. p. 378: Ragnorak – from Encyclopedia Mythica. Ragnarok (“Doom of the Gods”), also called Gotterdammerung, means the end of the cosmos in Norse mythology. It will be preceded by Fimbulvetr, the winter of winters. Three such winters will follow each other with no summers in between. Conflicts and feuds will break out, even between families, and all morality will disappear. This is the beginning of the end. p. 383: Njoro – from Wikipedia. Njoro is an agricultural town 18 km west south west of Nakuru, Kenya. Njoro is the divisional headquarters of Njoro Division of Nakuru District. It houses the divisional headquarters of the provincial administration and the police. p. 384: vicissitudes of life – changing phase or contition; a change or variation occuring in something. p. 383: bugbear – from Wikipedia. A bugbear is a legendary creature or type of hobgoblin comparable to the bogeyman, bogey, bugaboo, and other creatures of folklore, all of which were historically used in some cultures to frighten disobedient children. Its name is derived from an old Celtic word bug for evil spirit or goblin. In medieval England, the Bugbear was depicted as a creepy bear that lurked in the woods to scare children; it was described in this manner in an English translation of a 1565 Italian play The Buggbear. p. 388: “. . . .multifarious complicated requests and proposition. . .” – multifarious = having many parts; elements; forms: having great variety; diverse. This entry was posted in Book Club. Bookmark the permalink.